They say you can judge the character of a man by the company he keeps. (I’ll assume that principle applies to woman as well) I know I gravitate to those I would consider like minded individuals who enjoy the same things I do. So basically that means I hang out with fisher types who consider a day on the water superior to just about any other entertainment possibilities out there. It also means the company I keep is well versed in the fine art of fraudulent behavior. The way I see it, we fisherman lean so heavily on the fraud front we all could be pinned as the masters of deception. Ask any fish and I have no doubt they could confirm. We are all participants of fraud, lies, deceit, misrepresentations, shams and scams, i.e., flies, lures, bait, casting, presentation etc…Throw in a bucket of fishing tales and erroneous fishing advice and we’ve got a solid case of fraudulent characteristics for the whole lot of us. I don’t believe any of us need to visit a confessional over our acts of deception against fish. They are fish and we are the humans who work so hard at fooling them. Clearly we are the superior species that need not explain or justify our counterfeit efforts. We only need to observe one fisherman standing in partially frozen water with blue lips and icicles hanging out his nose to appreciate his repeated act of deception as pure brilliance. The whole scenario makes logical sense and only a non-fisher would question the rationale of it all…….. I think the deception of fish as a general human habit shouldn’t count against our personalities. However, I’m not so sure about the behavior we occasionally display towards the other fisherman out thrashing water with us. The little white lies that tend to slip out fall into a new level of fraud. Is it really so bad to add an inch to a fish no one actually saw? Is it a crime of the moral compass to imply you caught those 5 great big submarine fish on a #12 stonefly when in reality you caught them on #18 disco midge? Are such misrepresentations significant enough to blemish a persons wholesome demeanor? There is of course the unavoidable question on the waterway, “Have you caught anything today?” Answering this question truthfully or shrouded in deception falls into the case by case scenerio with sublevels, exceptions, iron clad rules and subjective interpretations. And so on…….Strangers encountered can be answered on the sliding scale of personal mood. Just smile while you answer and anything will sound peachy. I don’t mean to imply we are all liars and of low character, not at all. I happen to think fisher souls are some of the best quality people around. I’m just merely remarking today on the fine art of fraudulent behavior fishing requires in all of us. On the whole, I surround myself with people who know a little sumthin about trickery and I’m good with that fact. Disclaimer 1: Any ideas I may have expressed in the above paragraphs should fall into the acceptable guidelines of deceptive fishing practices when applied properly. I like the analysis, Rebecca. My wife, who periodically fishes with me, uses artificial lures, but is absolutely mortified at the thought of using any artificial scent, be it an attractant or masking agent. “That’s cheating”. Everyone has a little diffrent outlook on stuff like this. You’re very right about everyone’s outlooks being individual. There are several things out there I consider ‘cheating’ as well, but figure to each their own. There’s so many ways out there to fish, that I love listening to people who fish a wide variety of fish and ways…..
My bumper sticker “I FISH THEREFORE I LIE”! Fishin stories are great! We all live for em go to the local hang out or coffee shop and sponge em up….therefore we go out to get greater and bigger than the tale told….gotta luv it! I always keep it clean and my deceptions free from any possible legal issues. Thanks for coming by ~ And I’m always smilin….. I, for one, may be the only fisherman to never have told a lie. AS far as you know. “This is a Gear Review. After promising a blog free of gear reviews, I find myself posting my second in less than a month” —clearly a deception after a promise. ” I don’t do gear reviews, per se. Well, like so many fishermen are prone to do, I lied” —–I call that outright admission. Sorry, you’re a fisherman and a master at deception, it’s in your blood. Kirk… Sorry man.. but ummmm you’re BUSTED!!!!! On Kirk’s behalf I will say this. At least, he prefaced and admitted his indiscretions. Kudos to you man. 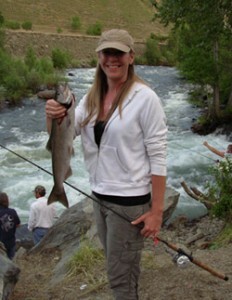 Personally, most of my fish are documented via photo and my rod has been marked starting at 12″ and every inch to 25″. Now, this is for my own assurance when “guess-timating” fish, so I at least get “close”, and not have to stretch them too much to degrade my moral fiber. As for the answers given to fishermen I meet on the river? Mostly accurate. If they’re friendly and they respect my space, well they get the truth or something very close. I may or may not tell them which fly or flies I used, but I will be honest on how many I’ve caught. I try to be “ethical” if there is such a thing on the water. “Invading” another’s space, splashing about, throwing boulders in the river is just irritating and quite frankly just pisses me off when people do it to me. Ya know, that golden rule thing, and I just be a good person. Plus the whole karma thing comes to mind. Here’s a funny story (at least I thought it was). I was fishing in one of my favorite fishing holes on the McKenzie back this past September. These two guys come tooling in and decide they’re gonna just jump in the water in front of me. They didn’t acknowledge me or ask if I minded or even attempt to make contact with me beforehand. They just did it. Neither of them were very adept at fly casting (not that I’m an expert by any stretch of the imagination nor would I ever claim to be). These guys were swinging their fly rods around like their rods were lightsabers in a duel with Darth Retardus. I kinda chuckled to myself, and went about my pounding of the water. Not four or five minutes after they started fishing, I hang into a nice 12″ rainbow. I landed and released it. About 30 minutes after they arrived and invaded my fishing hole, neither of thems had caught anything. They had moved up the river a little ways. By this time, I was now fishing where they had been. A couple casts into where they were, I hooked and landed and released a nice 14″ trout. A few minutes later another fish (whitey this time). It was sweet silent revenge. I never said a word to them, nor did they to me. The desire to gloat was welling up within me, but judging by the looks on their faces, catching 3 fish to their none was sweet retribution enough. They soon packed up their gear and left. That day was one of my best days there. If memory serves me correctly, I caught 6 or 7 that day. It was the Star Wars analogy….you crack me up Dave! To funny and thank you for sharing that story. I thought it was great. My God, I’ve been found out. I feel I should be taken away in handcuffs. Just kidding. I don’t know a fisherman that didn’t catch one this!…..!…………………….! big. I agree with you that you have to deceive them or maybe just offer them what they want. But what you’ve caught? Certainly not going to tell the guy walking by how many and he won’t be able to see your stringer because you practice catch & release. OH, what a tangled web we Fishermen & Fisherwomen weave. i never lie about fishing….or the size of them. Like any good fish should, they grow a few inches a year so the from this big to a foot longer years later is just how big the fish should be by now…..
@Rob That is a damn good theory! The level of fishing truths vary depending on who’s asking. I never catch fish here, those creeks that I walk miles into never hold a darn fish. I caught nothing but chubs, the water is to low, to high, to murky or to warm. I ran into a nest of yellow jackets, hornets and I swear I seen a bear or two. Last time I tried fishing up there I was shot at and chased out of there by a half naked cross eyed banjo player yelling c”mere boy! And to beat all, I have seen the most snakes up here I have ever seen in the last 10 years! I did hear the large mouth are tearing it up at the lake, might try there. @Dan/Dad I knew I got my theory from someone and looking at those stats, I’d say it was from you! Those are good stats to live by!